I'm sure there are loads of cats in the Essex area who would answer to your description. Many cats are branded as not good with dogs or children but often they have never associated with either. In my experience dogs and cats get on fine together unless the dog is one of the more aggressive terrier breeds or fighting breeds. In fact, it is usually the cats who rule the roost. If you buy a gundog breed (loads to choose from....) I don't think you will have any trouble at all. And at the moment you don't possess a dog so who knows what will pan out in the future. There is definitely a little sweetheart in one of those centres waiting for a visit from you. 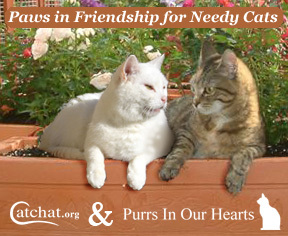 Sharon took a call about a pure white senior cat that is deaf and has been abandoned. A man is looking after her temporarily after taking her to the vet. We could probably get a photo on Friday if you are interested. This is the one that nobody was in when we got to the house after arranging to go over. People are so annoying we try to help the cats but people are selfish and ignorant. The grey is gorgeous but they won't separate her from her friend. I don't know much about rescues in Essex as I am in Kent. I know my mum ended up with a totally unsuitable cat from CP in Essex - she asked for a companion lap cat but ended up with a skittish one that isn't that friendly with her and won't sit on her lap. After 2 years, she obviously wouldn't part with her but I know she is disappointed as she made a point of asking for a friendly laid back cat after my dad dying as she wanted company. I know Millysmum is Essex based so she might have a better idea. If you didn't mind travelling, there are plenty of rescues in Kent. I am a volunteer with Canterbury CP. I don't think it does anyone any favours, least of all the cat if owner & cat don't suit each other. Like any other place, there are some idiots working in rescue but the cats shouldn't have to suffer because of it. I know Bryony had loads of trouble with officious staff at an RSPCA centre but put up with it to get her 2 kits. I would consider a pair but am actually a bit upset with this centre as had been in e mail contact and told that there were some suitable cats there but drove all the way there and none suitable As per my criteria I would like to have a dog and children in the future and there were none where this was possible. to Purrs, Nicola. There are a few rescue members on here quite local to you, so fingers crossed. I'm looking to adopt a cat - its taking forever to go to individual sites. Have had a recent let down on one I really liked so can home immediately! Do you know this cat? Nikki, I've modified your post to protect your email address - folks can still see what it is!